Ownership / Access: Municipality of Farciennes. Notes: Farciennes Castle (French: Château de Farciennes) is a derelict 17th-century castle in Farciennes in the province of Hainaut, Belgium. 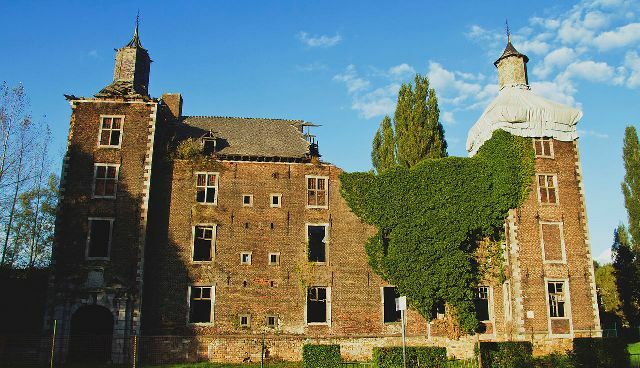 The present building stands on the site of an earlier castle of the 14th century.The first record of the castle at Farciennes dates from 1344, when Adolf van der Marck, Prince-Bishop of Liège, gave Hendrik of Farciennes permission to restore and strengthen his castle. On 23 September 1408 the united armies of John III, Duke of Bavaria (John the Pitiless), at that time Prince-Bishop of Liège, and his brother William II, Duke of Bavaria, defeated the rebellious citizens of Liège in battle on the plain of Russon. The victors ordered that the strongholds in the area be dismantled, which included the castle of Farciennes.